Out September 15, 2015, from WordFire Press. A week ago, I tried to explain—in the first of a multipart series—why I decided to write a book about Neil Peart, lyricist and drummer for Rush. Biographies of rock musicians generally either become fanboy lovefests, People-magazine exposes, or clinical dissections. I pray and assume I’m guiltless when it comes to the second and third reasons. I’m sure, however, that I will rightly be accused of the first. The youngest of three boys, growing up in central and western Kansas, I happily had a mother who allowed us to listen to whatever we wanted and read whatever we wanted. Television was never huge in our house, and I’m still rather mystified when peers of my age group quote The Brady Bunch or The Partridge Family. If I had the choice between tv and listening to an album, the album won every time. I don’t remember a time in my life when music wasn’t playing somewhere in the house or in the car. And, it wasn’t just rock. We listened to classical and jazz. Never opera, and I despised musicals and county music. I did come to love opera, but only in my adult years. Almost every room, however, had some form of stereo system, album collection, and headphone. From the age of 10 or so, I could hook up a fairly complicated stereo system, splice speaker wires, etc. Though my brothers have long given up their love of progressive rock music, they did love it immensely in the early 1970s. My oldest brother is 8 years older, and my older brother five years older. From around 1971 or 1972 (I was born in 1967), I remember Jethro Tull and Yes. Soon, it would be ELO, Kansas, and Genesis, too. Rush, though, I’d never heard—or, at the least, if I had heard them, the band did not make an impression on me until the spring of 1981. For some reason that I have since long forgotten, I got in trouble in the spring of 1981 while at school Back then, when discipline was still a central part of junior high education, any one of us could get any trouble for almost anything. No one questioned it back then. If the teacher or an administrator decided you were in trouble, you were in trouble. I was a very good student when it came to academics, but I could care less about rules. In fact, I hated them. Regardless, in the spring of 1981, I earned a detention—which meant sitting in the school library around a wooden table with the other kids who had earned detention. That day, it was me, another kid named Brad, and Troy. I’d know each of these guys since first grade, and I’d always been friendly with them. We weren’t, however, close. Troy, if I remember correctly, was wearing a Duke (Genesis) pin on his jacket. Of course, I was immediately taken with it. You know Genesis? I know Genesis! Exactly moments for a 13-year old. It turned out that Brad and Troy knew as much as I did about prog, but they had definitely embraced harder prog, while I had always gone for more symphonic prog. Have you heard the new Rush yet, one of them asked me? Rush? No, never heard of them. Oh, Brad, you have to listen to Rush. Moving Pictures might be the greatest album ever made. I can still see my 13-year old self reading the lyrics of Moving Pictures. I read them again. And, I read them again. And, again. And, again. And, the pictures of the three guys who made up the band? They looked so cool. They didn’t look hippiesh and all wizardy like the Yes guys on Yessongs. No, these three guys looked like they could’ve grown up around the corner from me. So, there you have it. Neil Peart has been my hero since detention at Liberty Junior High School, Hutchinson, Kansas. He taught me not to be him, but to be myself. Thank you, Brad and Troy. Thank you long forgotten teacher who thought I was a trouble maker. You were probably right. Little did you know, however, that you were the catalyst that lead me to Rush and to Neil Peart. And, here I am, thirty-four years later, and I’ve just written a book on the guy. On September 15, 2015, WordFire Press, founded, owned, and presided over by the incomparable Hugo-nominated science fiction author, Kevin J. Anderson, and his equally amazing wife and famed author, Rececca Moesta, will be publishing my biography, Neil Peart: Cultural (Re)Percussions. It will be $14.99 for the paperback and $5.99 for the ebook (all formats). 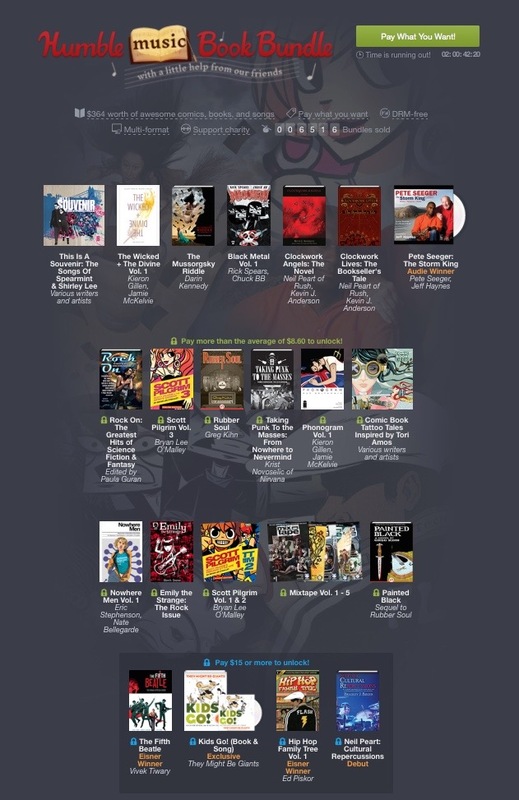 For another 48-hours, however, you can order it as a part of the Humble Bundle Music Book Bundle. 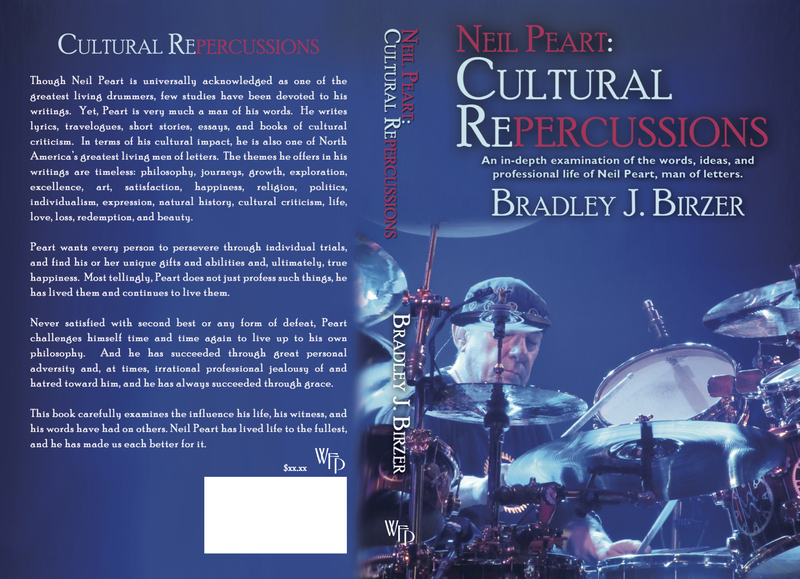 For $15, you can get an advanced review copy of NEIL PEART: CULTURAL (RE)PERCUSSIONS as well as a number of other fantastic books, including CLOCKWORK ANGELS: THE NOVEL. And, you even get a preview of the sequel, CLOCKWORK LIVES. It’s well worth it, especially for just $15.